Who needs bread for wraps? 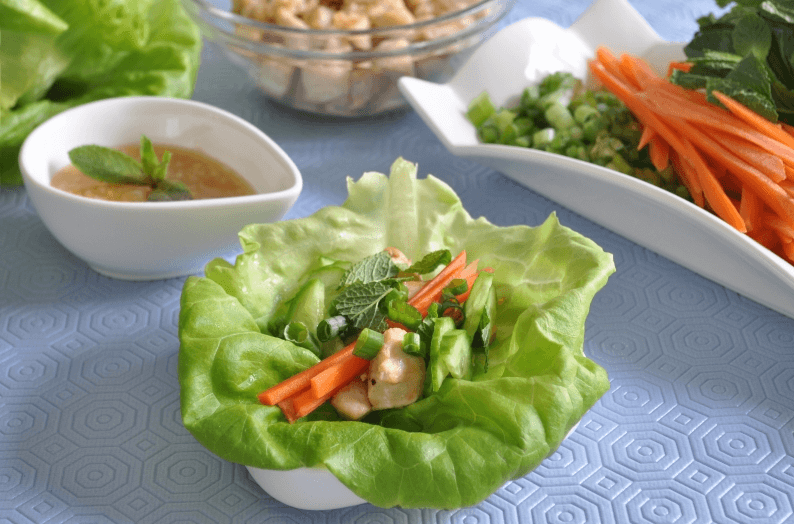 I always find that using lettuce cups really allows the flavors of the wrap contents to shine through. This dish has an asian flair, and as a bonus, is kid friendly! 1. Heat a small saucepan over medium heat and add white wine vinegar, garlic, honey, ginger, arrowroot powder, and salt, mixing well. Bring to a boil and allow to simmer for 1-2 minutes, until thickened to desired consistency. Set aside. 2. Sprinkle the chicken with salt and pepper to taste, and heat coconut oil in a large skillet over medium-high heat. 3. Add chicken and cook 2-3 minutes, until chicken is no longer pink in the center and cooked through. Set aside and allow to cool. 4. Carefully remove 8 leaves of the butter lettuce and leave whole. 5. Evenly distribute portions of cucumber, carrots, chicken, green onions and mint leaves in the center of each leaf. The leaves can be folded as you eat them – sort of like a taco! 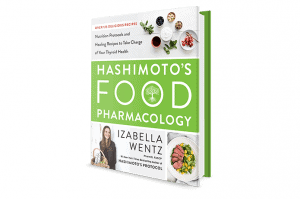 Ever wonder what to eat with Hashimoto’s? My new cookbook, Hashimoto’s Food Pharmacology: Nutrition Protocols and Healing Recipes to Take Charge of Your Thyroid Health, is for the busy people who are ready to take charge of their health and need a friendly nutrition guide filled with delicious recipes that don’t require them to spend all day in a kitchen! Are you ready? Click here to order your copy now.